Bowser’s Peace Sanctuary is a judgment free, safe place to experience, connect, and heal with nature. Here you will find a chance to sit with the spirit that is nature and Mother Earth, and some of her creatures. Our experience is that this connection is vital to well-being, and we are creating a peaceful place where people can experience a guided tour to meet Bowser, the American Black Bear who shares his amazing spirit to help us all contemplate a different perspective. 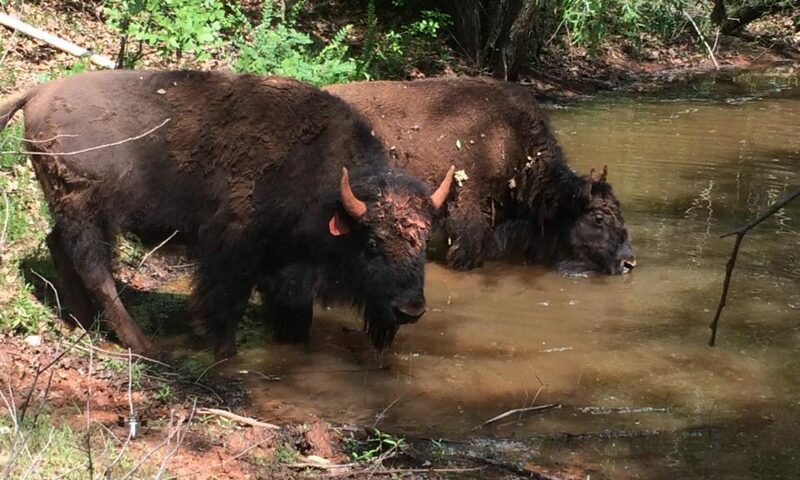 You can also meet, feed, and get lost in the powerful presence of Billy & Bambi the American Bison, as well as several horses, and our wonderful pack of Great Danes. To make a donation to help us build and improve the peace sanctuary, please visit our GoFundMe site. To help build and improve the Peace Sanctuary, please see our Events page here. TECUMSEH, OKLAHOMA — [transcript for KFOR story] Walking his property on an early August morning, Stanton Pace claims he can feel the peace emanate from this little corner of heaven. Of course there are chores to do, especially when you have animals. The horses get a few cubes of alfalfa, his bison too. But this morning is a little more special because of another animal that lives on Stanton’s place. Bowser, his six-year-old black bear has a brand new enclosure, something new and unfamiliar to explore. “Will he eventually like all this extra space,” asks a visitor? The last time we paid a visit Stanton Pace was doing a lot of wood carving with his live model. Bowser lived next to where he worked which was fine, but Stanton though his big friend could use more space. Besides, people seemed to kind of like this large creature. Maybe it was the novelty of it or something else, but Pace felt it too. “We like to hold hands and take sunset walks,” he crooned. “I truly and gladly and gratefully feel an obligation to share him,” he continues. Over the past few years Pace and Bowser have quietly built up a kind of retreat for lost people. Stanton counts himself among that number as well. He thought they needed a retreat to meditate, to get away from their problems. After all, it’s not the first time somebody ever thought of a place in the woods with a friendly bear as a place that might sound appealing. This version of the ‘Hundred Acre Wood’ is big enough to share just like the book. Stanton Pace, and Bowser too, it would appear, like it that way. Bowser’s first full day in his new enclosure was Monday, August 6, 2018. Like seeing videos of Bowser and the other amazing creatures at the Peace Sanctuary? Subscribe to Bowser’s Peace Sanctuary YouTube channel. Please contact us at bowserdad8@gmail.com with questions.